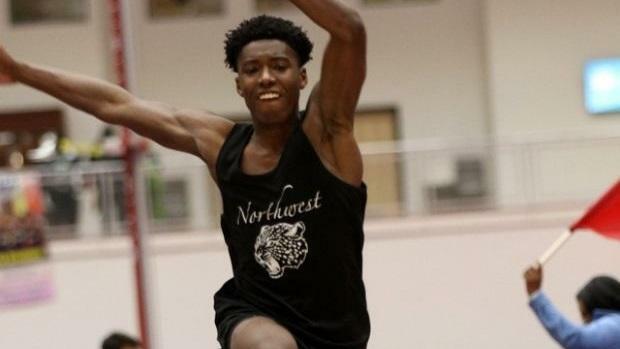 In his first season competing in the triple jump, Northwest junior Clarence Foot-Talley had established himself as one of the better competitors in the state, consistently jumping 42 and 43 feet throughout December and January. That all changed on Friday. Foot-Talley won the non-invitational section of the event at the Virginia Showcase with a jump that would have placed him third in the invitational section. His 47'1.00 effort was a personal best by well over three feet, and the best so far in Maryland by over a foot. In one day, Foot-Talley went from having the second-best triple jump mark on his team to being second to none in the entire state. Not to be outdone, Bullis senior Eric Allen topped his breathtaking performance at last year's Virginia Showcase in the 300. Allen finished second in the AAU Invitational section, but his time of 32.84 is likely the fastest time ever recorded by a Maryland athlete in the event. Allen wasn't the only standout Maryland athlete in the event, however; DeMatha's Brendon Stewart won the non-invitational section with a big personal best of 33.86, a US #5 time and second in MileSplit MD's database which dates back to 2000. Dalton Hengst continued his mile dominance with a 4:13.63 victory in the AAU Invitational section and will gear up for a fast invitational 1000 on Saturday. Meanwhile, back in the sprints, Eric Allen's younger brother, sophomore Ashton, won the 200 meter dash with a time of 22.28. Five of the top six boys in the event were from Maryland. Only two relays from Maryland competed on Friday. The DeMatha boys finished fifth in the shuttle hurdle relay with a time of 33.96. The Wise boys, fresh off of their victory at the PG County Championships on Thursday, placed third in the championship 4x400 with a new MD #1 time of 3:23.77.